Having a cartoon guy as a brand mascot has brought a vast success for many companies we now admire and draw inspiration from, some of them older than a century! 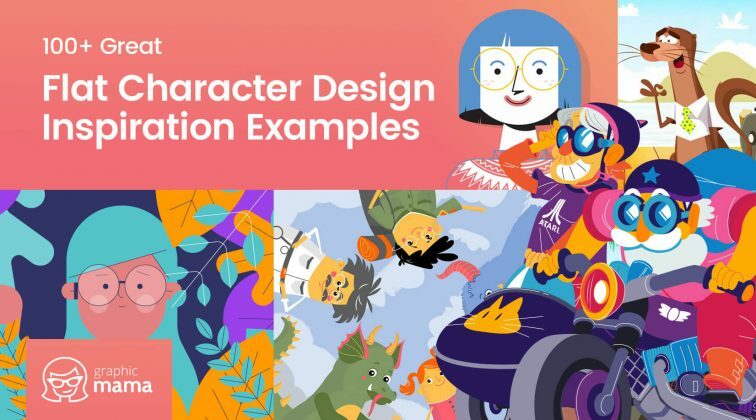 That’s why here at GraphicMama we’ve decided to make a retrospection and honor some of the most successful brand cartoon character designs of all time. Here comes our collection of 21 iconic brand mascots which have nothing but one quality in common: they have all brought ridiculously huge fame to their brands! The iconic brand cartoon spokesman of the popular tire company was named Bibendum but it has been widely known as the Michelin Man! Being presented to the world in the distant 1894 at the Lyon Exhibition by the Michelin brothers, the idea behind this plump brand mascot design was to represent a person made of tires. 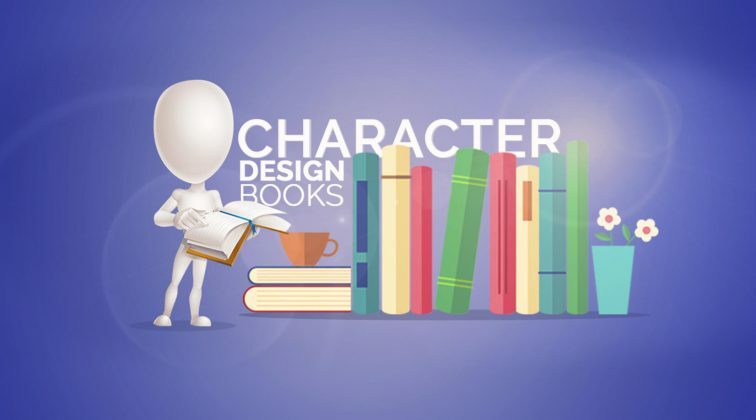 Little did the creators know that this charming fictional guy would become a largely popular and recognizable figure which has significantly contributed to the vast success of its brand. This famous peanut gentleman has turned 100 years this year! Mr. Peanut was actually not drawn by some famous illustrator but by a 14-year-old boy back in 1916, 10 years after the company was founded. Ever since, this brand mascot design has so much grown on the public that when Planters conducted a survey 10 years ago about whether to add a bow tie, a pocket watch or some cufflinks to it, the public response was: Don’t change a thing! A great design never gets old, doesn’t it? Well, here’s a brand mascot that has evolved a lot throughout the years! Born in 1921, this cheerful cow has appeared on the wrapping of all company’s products ever since, making them highly recognizable. Not only is this character instantly related to quality dairy products but it also puts the viewers at ease since it is always illustrated laughing. A strategy that simply works! Perhaps the first thought that pops in most people’s minds when they hear a great brand mascot: Mickey Mouse! Although these days a lot of cartoon characters are easily associated with Walt Disney Company, this friendly, lively mouse has been the official cartoon representative of the giant company ever since its creation, thus making it one of the oldest mascots which are extremely popular worldwide and loved by people of all ages. Guess 1928 was a successful year of creating memorable, long-lasting brand mascot designs. Here comes another one that survived through all these years: Jolly Green Giant appearing on all the products of the Green Giant brand. The cheerful friendly superhuman has made the brand easily distinguishable from its competitors and turned it into one of the brand leaders in the industry of frozen and canned vegetables. Well done, big guy! Rich Uncle Pennybags, or more widely known as simply Mr. Monopoly has been around since 1936 but it was not until 1946 that this famous drawn elderly gentleman actually received his name. Undeniably, the rich cartoon guy in tuxedo has become one of the most recognizable brand mascot designs since it was made the star of the original Monopoly game and all related games of the company. These days, he keeps appearing on all new Monopoly editions and is even incorporated in the brand’s logo. This one is often given as an example of a highly successful mascot and with a good reason! The cereal brand’s success simply wouldn’t be the same if it wasn’t for the friendly tiger character Tony, showing his charming smile and giving his approval with a thumb up from the cereal’s box. Being on the marketing field for over half a century, Tony has become a favorite cartoon character not only to a lot of children but to their parents, too! Initially known as the Pitcher Man, this unconventionally shaped brand mascot was designed with a large smile and a pitcher as a head entirely full of Kool-Aid flavored drink. 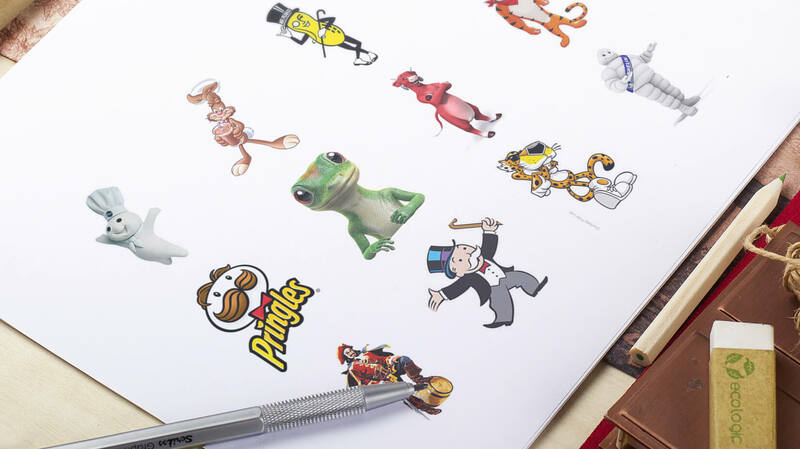 Targeting the kids as an audience, this famous mascot has become the perfect example of a brand character design depicting exactly what the company is about – a refreshing drink that would quench the thirst of any child. The famous rooster cartoon character was not always a spokesman for the brand but it was certainly the most memorable one since it was designed with a deep meaning. This friendly colorful rooster Cornelius was not only meant to be fun and playful animal brand mascot but he was also a symbol of the early wakening and starting off the day right – with a healthy breakfast. Being very little changed over the years, this bold muscular man made its brand the best-seller on the market for just six months in 1958! The huge success stayed by the cleaning company’s side for many years ahead, being an inseparable part of all its marketing activities and campaigns. Nowadays, this muscular cartoon guy is still highly recognizable and keeps its brand on one of the leading places in the industry. Appearing as a brand cartoon representative in the different countries for quite different timeframes (e.g, for just two years in the USA but for more than half a century in the UK), this friendly playful monkey with a cap has become a favorite face of many children, smiling at them from the box of their favorite breakfast cereal. The design of this cute perky monkey easily evokes connotations of laughter and entertainment which is the reason he managed to captivate the hearts of so many kids all over the world. The Pillsbury Doughboy has been on the marketing stage since 1965 as a unique boy character made of dough. The design of this cheerful cartoon character includes a scarf and a chef hat which give the impression of that this chubby chubby fella is a real master of cooking. To a huge extend, this smiling boy contributed to the success of the Poppin’ Fresh product line and even started appearing in other brand’s commercials. The choice of this charming mustachioed man as a brand cartoon spokesman of the super famous and successful chips company has a meaning that is not quite obvious at first but makes a lot of sense if you think about it more deeply. Julio Pringles has a head shaped like a piece of chips which, by the way, implies that all the chips pieces inside the unique package are equally sized. Also, the mustaches give the feeling of maturity and professionalism. Great job! The most famous bunny brand mascot loved by many people all over the world – the Nesquick’s Quicky! The choice of this animal as a brand representative is not a coincidence. The bunny evokes instant connotations with speed which implies: you can easily prepare the chocolate-flavored drink, then quickly drink it and you’re good to go! Quicky’s outfit which gives him the really “cool” look is also symbolic and an inseparable part of this cartoon character’s design. 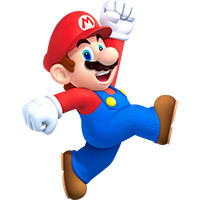 Did you know that this memorable Italian plumber character was initially called Jumpman? That’s right! Even though Mario was not designed with the typical appearance of a superhero, he grew on the wide public so much that he has now become an iconic character, recognizable all over the world. An interesting fact about this cartoon character’s design is that it was entirely determined by the limitations of the graphics of the early video games – blocky pixels are the reason he is now a proud owner of a mustache and a big nose! Inspired by a real person, the famous alcoholic beverage company’s brand hero was actually designed by Don Maitz, an artist who is a master of science fiction illustrations. Being the only rum brand with a pirate captain as a mascot, this character made the alcoholic beverage highly recognizable among the others and became a symbol of quality rum. The famous cheetah mascot has been by Cheetos’ side for a few decades now. This memorable animal character has overgone several transformations throughout the years regarding the message he conveys to his target audience but his overall appearance has pretty much stayed the same. Besides being the face of all Cheetos’ products and the star of all Cheetos’ commercials, this cool cartoon guy even became the protagonist in a few Nintendo games. The same year that Cheetos presented their famous cheetah character, another company in another industry came up their handsome superhero cartoon character who has now become a legend: Mr. Muscle! This muscular brand mascot, owned by S. C. Johnson & Son, became highly popular as the tough guy who could clean any surface with his cleaning detergent as a powerful weapon, which led to a huge success to his brand. The company with not one but five recognizable mascots! The choice of the cute colorful spokescandies as brand representatives was such a clever decision of Mars since these guys entirely gave the idea of the M&M’s product line and simply couldn’t be confused with anything else. Since they were five, the company gave them names corresponding to their colors which made them super easy and intuitive for the audience to remember. Nice move, Mars! Here is a brand mascot design resembling the founder of the company itself: Colonel Sanders, a founder of KFC! Who would have thought that a human face could make such a memorable and widely known mascot, incorporated even in the company’s logo. Created years after the death of its founder, this friendly smiling face with glasses, white hair and goatee certainly has turned out to be a super successful choice of a brand character conveying professionalism and vast chef experience. The quirky lizard character’s name was actually chosen due to the many mispronunciations of the brand name itself. Being the first most identifiable brand representative of the car insurance company, this cartoon character has certainly become a legend. 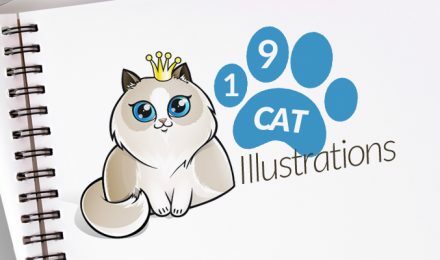 True, it was not designed as the usual cute-looking brand cartoon but still managed to grow on the audience as a little green insurance expert conveying professionalism and reliability. Which other famous brand mascot would you add to this list? Glad you liked it, stay tuned! That’s true. 🙂 And the same mascots in different countries are differently popular! True that! Will update soon! How about Trump, from the Trump Org fame?